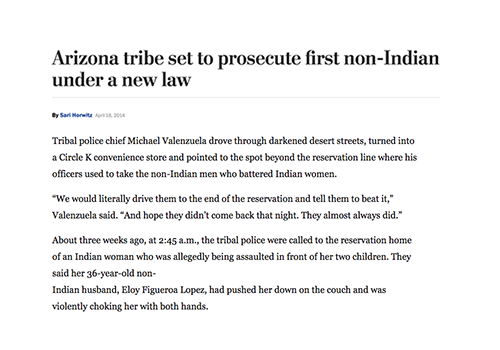 Tribal police chief Michael Valenzuela drove through darkened desert streets, turned into a Circle K convenience store and pointed to the spot beyond the reservation line where his officers used to take the non-Indian men who battered Indian women. About three weeks ago, at 2:45 a.m., the tribal police were called to the reservation home of an Indian woman who was allegedly being assaulted in front of her two children. They said her 36-year-old non- Indian husband, Eloy Figueroa Lopez, had pushed her down on the couch and was violently choking her with both hands.